Photo by Kim Nguyen Farm Technician David Vincent gets caught moving some trellising supplies across the middle canopy at East Fork Cultivars. Photo by Nguyen Cannabis flower is removed from branches during East Fork Cultivars’ 2017 harvest. 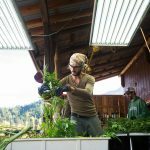 Photo by Kim Nguyen East Fork Cultivars’ harvest team processes large cannabis plants, preparing flower-bearing branches to be hung in on-site drying rooms. Photo by Kim Nguyen CBD-rich cannabis plants stand in the south canopy at East Fork Cultivars. East Fork grows cannabis with unique chemical profiles, selectively breeding for cannabinoid and terpene diversity. If there’s one thing that is noticeable when talking with Mason Walker, chief executive of East Fork Cultivars, a CBD-focused grow in Takilma, it’s his transparency. The level at which he explains things — whether about the company’s cultivation techniques, business practices, philosophies or opinions about the cannabis industry in general — is clear, concise and earnest. 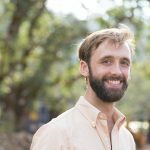 He answers questions willingly; this could be because of his seven-year stint at the Portland Business Journal, or maybe it’s because he truly believes in what he is doing and is proud of what the farm’s family is creating. 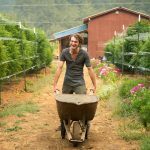 But one thing is for sure — he’s passionate about the farm and the power of cannabis, particularly CBD. “He is a humble person, but brilliant,” says Aaron Howard, co-founder and chief operations officer, while sharing stories of getting to know Walker during the early days on the ranch, before Walker was officially hired in March 2017. Growing CBD in Southern Oregon is not new for Howard. At about age 17, he took a class to learn how to grow cannabis after his older brother, Wesley, had his first seizure. Wesley was born with myriad illnesses that got more pronounced as he got older, and he developed epilepsy because of a brain tumor. As a result, Howard developed more of an interest in CBD due in part to learning about the Stanley Brothers, who developed a popular CBD cultivar called Charlotte’s Web that’s said to help treat seizures and other medical conditions. He continued to grow for his brother, but he started to transition out of growing THC, just as legalization was coming to pass. His younger brother, Nathan Howard, who is active in the cannabis political and activist scene, quipped that Aaron was just getting out right as he could make a good life for himself. So, in 2015, the brothers grew a small crop that drew tremendous interest — they took it as the proof they needed to move forward. The neighboring property from where Aaron lived in Takilma became available — a former llama breeding ranch surrounded by the Siskiyou Mountains — and through friends, family, community support and loans, they were able to raise the money to buy the nine-acre site. 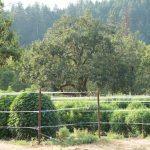 East Fork Cultivars holds a Tier II license, producing 40,000 square feet of mature canopy. The flower is 100 percent sungrown and organized into three separate sections divided by cannabinoid ratio: the first section is CBD dominant, the second has a couple percentages of THC, and the third is a one-to-one ratio of THC to CBD. The ranch also has a plot of three acres just for hemp, which is an area the company is expanding. As this story was being written, East Fork was in the process of acquiring 24.4 acres of land for hemp production just south of its current location, through Steward, a private lender and crowdfunding platform specializing in helping young farmers. “A lot of folks are growing hemp this year,” says Walker. “I think we are going to see an explosion of high-quality craft hemp in Oregon this year.” He adds it won’t be long until the U.S. is the largest producer of the plant, and Oregon likely will have a big role in that. Industrial hemp, according to the federal government, is defined as cannabis that tests .3 percent or less of THC. But the big difference — and this is where the company’s goal of diversification comes into play — hemp can be sold nationally, while cannabis can be sold statewide only. On the new property, East Fork will be able to grow 18 acres of hemp. Instead of going through the Oregon Liquor Control Commission, the company just needed to obtain a permit to grow hemp through the Department of Agriculture — a process that was much easier and cheaper. In 2017, East Fork Cultivars harvested 3,300 pounds of untrimmed flower otherwise known as sellable product. A majority of that raw cannabis goes to a carefully vetted group of processing partners. In Southern Oregon, Walker says, for many outdoor cannabis farms, the main source of revenue is trimmed flower, and while that product is still the largest product by revenue, that piece of the market pie continues to shrink. “New cannabis consumers are not buying flower, they are buying infused kombucha and cartridges and chocolate bars,” says Walker, making it clear it’s not an exhaustive list. And as a result, the company has diversified its products. So, while the farm does sell flower and pre-roll joints, those products are less than half the company’s revenue and less than 20 percent of its harvest volume, according to Walker. Turns out it was good business sense, especially last fall when the flower market crashed due to oversaturation. East Fork partners with more than 20 processors — focused on products such as chocolate, cartridges, tinctures and topicals. “As we watch these products ebb and flow, we are diversified enough across all the different segments that we can absorb different cycles and the pressures of the market,” Walker says. Aside from partnering and sharing a label with East Fork, the products made by partner processors get the benefit of being given out during the company’s statewide educational program managed by Anna Symonds. 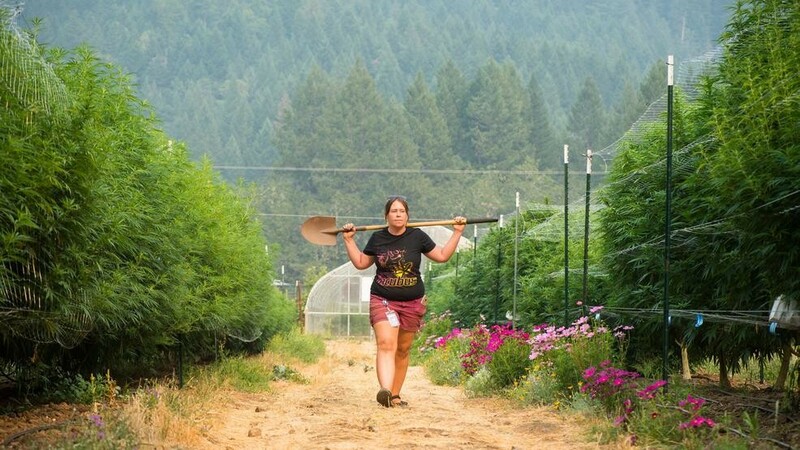 Symonds joined East Fork in July 2017, after she met Walker at Oregon’s Cultivation Classic, a competition for craft cannabis produced in Oregon. At the time she was doing management and business administration work for another grower, helping it transition from medical to recreational as well as helping patients coordinate their medical deliveries. 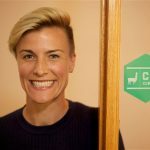 Around the same time, Symonds, a competitive athlete, was dealing with a chronic back injury from 2013, so she became an Oregon Medical Marijuana Program patient and started exploring using CBD in more sophisticated, nuanced ways. As she was learning more about CBD and its healing elements, East Fork was considering developing an educational program directed at dispensaries to help better inform budtenders about CBD. A skeleton program was developed with help from consultants, but it was Symonds’ job to flesh it out and give it legs. They started giving beta presentations to processors, and with their feedback they were able to hone the presentation and conduct a soft launch in December with a full roll-out in January. Today, the hourlong presentation is called CBD Certified, and it’s free to any licensed dispensary in Oregon. From January until the end of June, Symonds says she’s been to around 60 dispensaries and given more than 30 presentations to processors. The goal is to make it as easy as possible for dispensaries to access the information to understand CBD more fully. 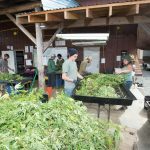 Providing the program for free to dispensaries is an investment on East Fork’s end, Symonds says, considering the farm is still small and she is being paid a full-time salary for facilitating the program. Symonds says she’d like to collaborate with OLCC to create educational courses for budtender certifications that are funded by the taxes generated by cannabis. This is to help dispel the myths that still exist around CBD. One such myth is that CBD is nonpsychoactive, which according to Symonds is not entirely accurate.